RégimA is the most advanced, medically accepted, skin care programme created to attack the ageing free radicals and toxins associated with modern living. These elements are responsible for most of the skin’s visible signs of ageing, including loss of skin tone and wrinkles. Without the help of RégimA’s technology these toxins will surely cause premature ageing. Years of scientific research have culminated in this ultimate regime, which is simplicity itself. 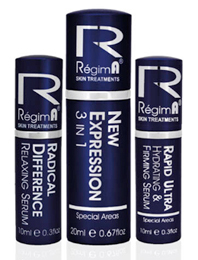 RégimA is a unique skin rejuvenation and treatment range manufactured for the use of doctors and skin care professionals. Extensive use of the very finest potent natural ingredients from Europe, South Africa and other tropical regions and indigenous wound healing, skin repairing plants, ensures RégimA’s status as a skin treatment leader in the world market. We are not just talking ‘normal’ cosmetics which may feel nice, smell nice and keep the skin hydrated, but are just moisturizing outer dead skin. To really rejuvenate one has to remove that outer layer which shows all signs of ageing, revealing a much fresher, more youthful skin. RégimA is a cosmeceutical focusing not only on AESTHETICS but SKIN HEALTH.